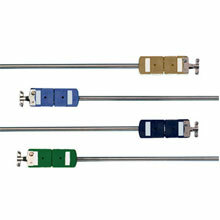 Click on this link if you need more information about Thermocouple probes. OMEGA's quick-disconnect style thermocouples feature a colour-coded thermocouple plug moulded directly on to the sheath. Mating Connector and Clamp sold Seperately. The connectors are rated for temperatures up to 220°C. The probes are available with sheath diameters from 1.5 mm to 6.0mm. *Specify junction type: E (exposed), G (grounded) or U (Insulated). †Other lengths available, consult Sales Department. Nota: Custom lengths are also available, consult sales.